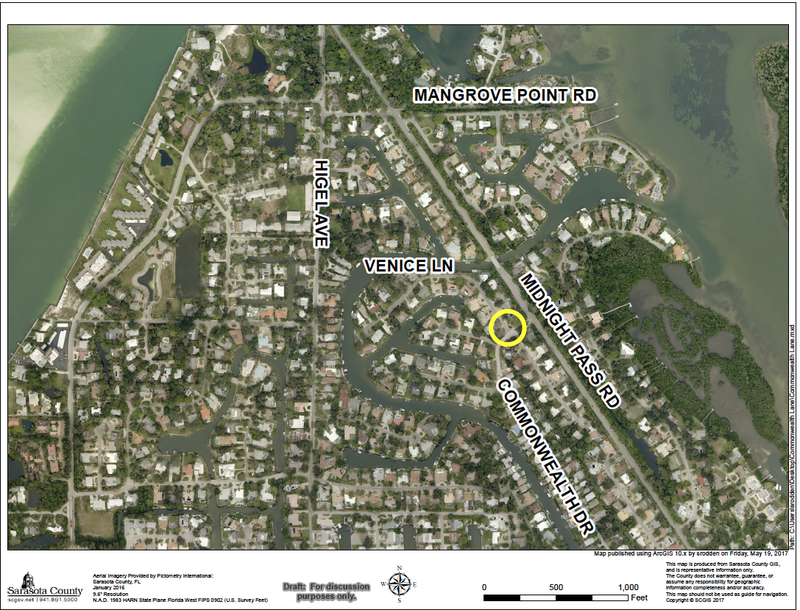 For months, residents of the affected Siesta Key neighborhood have been divided in their opinions about whether multi-way stop signs should be installed on Commonwealth Drive at the Venice Lane intersection. The residents who called for the board’s action cited safety as their primary concern. Two residents, especially, talked of their worries about drivers striking children who live in the neighborhood and have to walk between their homes and Midnight Pass Road because they take a bus to school. Mario Christaldi, who lives on Venice Lane, also pointed out that many people walk their dogs through the neighborhood, while others regularly jog along the roads. “It’s just a hazard,” he said of the intersection. County staff stated that the signs would be erected by the middle of March. Commissioner Charles Hines took the opportunity of the Feb. 27 discussion to rebuke the county’s Engineering and Operations Division manager for not having made a change in the criteria staff uses to decide whether stop signs are warranted on a street. Robert Fakhri told the commissioners that staff did not recommend installation of the stop signs, because the situation did not garner enough points in a system staff uses to make that type of determination. Nonetheless, the county’s Traffic Advisory Committee (TAC) had voted to recommend approval of the petition for the signs, Fakhri said. Mario Christaldi, one of the speakers who addressed the board on Feb. 27, noted that two of the law enforcement officers on the TAC were among the 3-1 majority. “Have you not added [that type of situation] into the criteria yet?” Hines asked Fakhri, referring to the point system Fakhri had mentioned earlier. “I thought this board voted to add … to the criteria” an extra point when an issue involved just a street within a neighborhood. It would be difficult for staff to define that type of neighborhood, Fakhri said. “We’re working on it,” Fakhri replied, noting that staff would have to prepare a resolution for the board to approve the change in the criteria. “I didn’t know it was that complicated,” Hines retorted. “I think we’d like to see it not that complicated, done a little quicker,” Chair Detert told Fakhri. After the vote, Hines addressed County Administrator Jonathan Lewis: “I think staff has had adequate time to add that extra language to the criteria.” He asked Lewis to find out when the matter would come back to the commission for a vote, referencing the resolution Fakhri had mentioned. During his presentation, Fakhri explained that Venice Lane is “just about a north/south roadway,” while Commonwealth Drive intersects Midnight Pass Road at a 90-degree angle. Commonwealth has no sidewalks or bike lanes, he continued. Its lanes are 11 feet wide, and the speed limit is 25 mph. 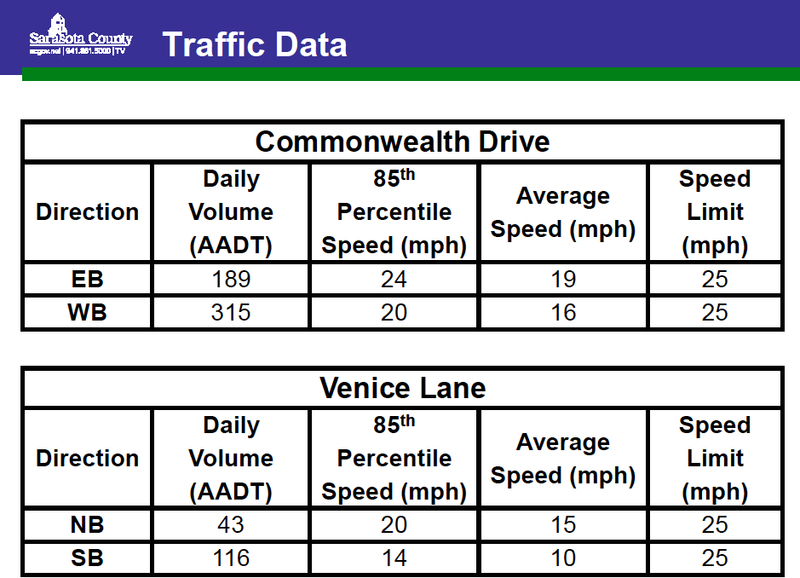 Traffic data show that the average speed on Commonwealth is about 17 mph, he noted, while the average speed on Venice Lane is about 15 mph. No crashes have been reported on those streets for the past three years, Fakhri said. Noting the county’s criteria for erecting multi-way stop signs, Fakhri told the commissioners that the points need to add up to at least 7; in this case, the total was 3. When Hines asked why the TAC voted to recommend the stop signs, Fakhri replied that the three residents who spoke during the TAC’s June 12, 2017 meeting all urged approval of the signs. Additionally, Fakhri explained, Sgt. Darrell Seckendorf, who represents the Sarasota County Sheriff’s Office on the TAC, offered his support of the petition. However, Fakhri explained on Feb. 27, a few months ago, after staff originally advertised the stop-sign issue as a County Commission consent agenda item, staff received nine emails opposing the installation of the signs. The consent agendas include routine business items that typically have not generated controversy or concerns from the public.